In this story, Maisie is far from the insecure young woman we fist met on that first book, the one trying to come to terms with loss, pain and differences in class. I like that Maisie seems to have come into her own as a woman and a professional. 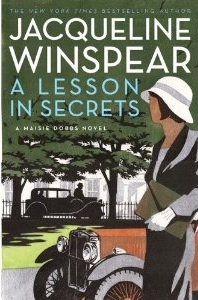 In A Lesson in Secrets Maisie is again coming to terms with loss, except this time she's dealing with the death of her long time mentor Maurice Blanche, as well as with the fact that she is now a young woman of independent means. Her personal life has also taken a new turn, as Maisie has entered into an affair with James Compton, Lord and Lady Compton's son. So, this is an adult and very different Maisie indeed. Maisie has been recruited by the British Secret Service to help investigate St. Francis College and she returns to Cambridge where anti-government activities are suspected. Scotland Yard is also investigating illegal immigration as a possibility. So while James is off to Canada taking care of business, Maisie goes undercover at the college posing as a philosophy professor. I like that this continues to be a historical fiction mystery series. This story is set in the period between WWI and the beginnings of what will become WWII. Hitler is just beginning to stir in Germany as his book Mein Kampf has been published. A murder takes place soon after Maisie joins the college staff and the investigation is off. Maisie discoveries include Nazi sympathizers, and while the British Secret Service concentrates on the Communist "red" threat, Maisie has her doubts. The investigation takes quite a few twists and turns with Maisie doing most of the investigative under cover work. What did I like? As with the first book, I liked the historical fiction aspect of A Lesson in Secrets, the setting and atmosphere. I think those are the strengths of this series so far. The plot is also quite interesting and I like that it was two-pronged, involving the crime investigation into the death of a pacifist which brought the readers into the WWI conflict, while details uncovered during the same crime investigation took a different turn by showing how seemingly insignificant and ignored events would later become significant moments in history, bringing the readers into what would become the WWII conflict. Both of these plot lines were really very well done and I highly enjoyed them. What didn't I like? Maisie as the main character continues to be tough to relate or connect to on different levels. To a certain extent, she almost seems to be emotionally disconnected from those around her, although she's portrayed as a kind person with a psychic empathic connection to others. I don't "feel" it though -- there's a distance there that doesn't make it seem real. Maisie's detecting skills are also questionable in this story. She's under cover and yet by the time she was in the college a week, I would have been surprised if most of the key characters didn't know it! Hush, hush was the word... and yet she didn't exactly know how to keep things on a confidential level. Her detecting tactics are quite obvious and I admit to being frustrated with them. I liked some of the secondary characters, particularly Scotland Yard Detective Richard Stratton whose presence in the story was strongly felt even though he was not quite key. Is it me, or is there more chemistry between Stratton and Maisie than between Maisie and James? I was left wanting more of this character and less of James. In summary I highly enjoyed the plot, the setting and atmosphere in this book, as well as some of the secondary characters. The main character remains the one average aspect of this series, and I find it interesting that I want to continue reading it despite that fact. It goes to show how important writing, plotting, setting, atmosphere and secondary characters can be to a story. Oh wow. I didn't realize this was book EIGHT in the series already! It's an interesting time period on which to write historical mysteries--and with a female lead, too. I'm glad to see you're still enjoying it, despite not feeling very connected to the main character. I think you've nailed why I'm waiting for my library to get this book in instead of buying it. I adore the very authentic setting and period, but Maisie and her psychic/empathic connection comes across as a lot more tell, instead of show, and yeah, it's hard to connect. I like James though I don't think he is *the* one for her, interesting that you think there is another romantic relationship being set up! Li, I'm glad it's not just me! I take into consideration the whole English reserve, etc... but, yeah... even with her internal dialogues etc... it's more tell than show. Don't feel it at all. When you read the book, let me know what you think about Stratton. I really liked him and there's definitely something between him and Maisie in the end. Or maybe I'm just hoping, lol! You read the first and this one only right? I'd probably try one just for the feel... but I doubt this is going to be for me. Nath, yes... I read the first and the last books in this series only. If you're going to read one book, I would recommend you try the first one to get the feel for the character and the series. Meeting a Friend, NYC, Dinner and Books! Winners: Impressions... 2nd Anniversary Giveaway!